The Flash prepares for the season finale with DeVoe putting the final phases of his plan in motion as the team scramble to stop him. It will be no surprise to regular readers that I have been struggling with this season. Outside of a handful of solid episodes and fun moments the whole experience has been a slog for me. That’s why things like the opening sequence of this episode are such a delightful surprise. It’s an incredibly well put together action sequence that showcases the extent of DeVoe’s abilities along with his complete disregard for the lives of others. There’s nothing to really analyse about it but taken at face value it’s an impressive piece of work that can’t have been easy or cheap to put together. If only the rest of the episode could measure up to what the opening delivered but sadly it doesn’t take long to go back to business as usual. Unfortunately that means more wheel spinning, irritating character beats and other associated nonsense. I say this a lot but I can’t believe how far the overall quality has dipped since the really strong first season. Most of the episode was focused on tired plot threads that have never been that interesting. Caitlin’s obsession with restoring Killer Frost is given a great deal of attention with almost none of it adding up to anything watchable. Seeing her in therapy talking about losing a “friend” exists to establish that there’s something in her childhood that she isn’t dealing with that really needs to be addressed. This is a completely new idea that could be interesting as developing characters by exploring their past often brings opportunities but the way this plays out feels clumsy. First of all I’m not sure why the bulk of the cast are all going into therapy all of a sudden though part of me thinks that the writers find the idea really funny so have all the character have a go. Using therapy to explore Barry and Iris’ relationship problems when he first returned from the Speed Force wasn’t especially funny to me at the time so returning to that well only heightens the frustration. A big issue with it is that the characters could reach the same conclusions by talking to each other so there’s no real need for this impartial third party. Whether it’s handled well or not is beside the point to a degree because the intended purpose is achieved. Bringing up her childhood as well as her relationship with her father is meant to put the idea in her head so the flashback she has to a bicycle accident doesn’t come from nowhere. It’s clumsily handled but makes at least makes sense within the confines of the story that is being told. Cisco Vibing Caitlin’s repressed memory reveals that Killer Frost has been a part of her for a lot longer than anyone thought. How that could be possible prior to the Particle Accelerator explosion is as yet unclear but clearly a thread to be picked up on at a later date. This isn’t the first time that Metahumans predating the Particle Accelerator explosion have been mentioned but it looks like this will be the beginnings of that mystery being answered. On a plot level it’s mildly interesting that Caitlin and Killer Frost have been connected for a lot longer than anyone assumed but her obsession with getting her alter ego back isn’t working because the audience is being asked to invest in something that is really poorly developed. I still don’t understand what the point of having Killer Frost as an alternate personality is and the show consistently fails to provide justification. It doesn’t provide any meaningful development for Caitlin nor does Killer Frost have a strong personality that makes the duality of Caitlin interesting. It simply feels like one of a number of things going on as with most things on this show at the moment. At least it isn’t as badly handled as Harry losing his intelligence. What could otherwise be a powerful exploration of a man losing what he felt defined him is being played for laughs and -in this case- provides an excuse for Harry to walk into chairs because he’s too stupid to notice them. It’s really tedious, frustration and a poor use of this character. This episode continues the idea of Harry concentrating on emotional intelligence which leads him to help Iris realise where Marlize is hiding. 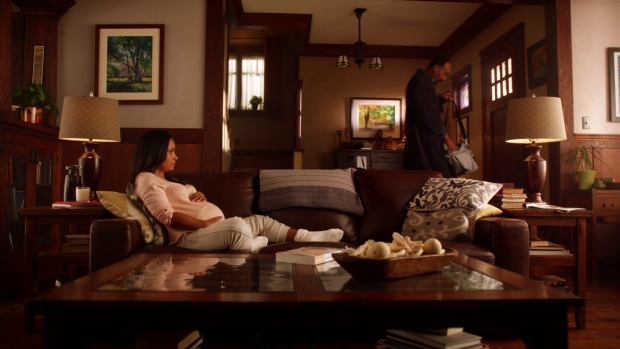 The revelation moment being connected to Iris’ first home with Barry making her feel safe is really clumsy and works in only a way crafted dialogue could. There isn’t much to say about Harry’s predicament because there’s very little depth to it and the handling of it is really poor. Iris’ triumphant return to journalism that closed out the previous episode goes nowhere here. There was the promise of Central City working to feed them information on DeVoe and help the team defeat him. It’s mentioned in passing but doesn’t really go anywhere. In essence it’s an abstract concept that means very little and doesn’t progress the plot significantly. As far as I can tell the purpose is for Iris to tell people that’s what she is up to without actually seeing her do anything with it. This is something the show does a lot lately which makes most of the storytelling feels empty because given plots basically exist to create busy work for the cast. Another tedious thread is Cecille’s ongoing pregnancy. Once again the attention given to this is made up of a collection of scenes designed to be funny that are ultimately meaningless. Having her bizarre temporary Metahuman ability allow her to take on the personality of people who happen to be nearby feels like a shameless attempt to copy iZombie without the clever writing. The most irritating use of that was taking on the painfully stereotypical personality of a pizza delivery boy. Taking on Joe’s personality is potentially interesting because she can in theory gain deeper insight into how he’s feeling by literally becoming him but once again it’s a meaningless distraction. It’s also flawed in the execution because it’s really no different from the reason behind her gaining the ability to read minds in the first place. A lack of clear thought into these sorta of stories is probably the reason behind them feeling so repetitive. Cecille is a great character played by a really talented actor so it’s a shame that more effort isn’t being made to give her more meaningful plotting. Cisco and Barry have something of a competition in this episode. They try to figure out who is more to blame for the current situation and make arguments for why it’s all their fault. This was by far the strongest thing going on because it does deliver some engaging interactions between Barry and Cisco. It’s something they haven’t done much of late and their conversations are definitely something I miss. Barry is still blaming himself for Ralph’s death and points out the time he encouraged Ralph to rise up in his place when he was in prison. He sees that as the catalyst for Ralph’s death because pushing him to become a hero is why he put himself in mortal danger. Cisco reiterates the point about Ralph being a better person because of Barry and having no regrets because sacrificing himself was in service of protecting those he cared about. This is well worn ground in one of the better episodes this season has to offer but the performances of Grant Gustin and Carlos Valdes really sell the conflict and I do like that Barry takes more than one episode to get over something as significant to him as Ralph’s death. The lesson Barry needs to learn -or re-learn- for the purposes of this episode is being comfortable with letting others put themselves in danger by helping him in the field. Doing this got Ralph killed so he’s reluctant to do that with Cisco and Caitlin. He says he can’t handle any more loss though he doesn’t realises that Cisco and Caitlin are willing to make that choice because they believe in what Team Flash is doing. Ultimately Barry does realise what he knew all along; that the team need each other to function effectively. 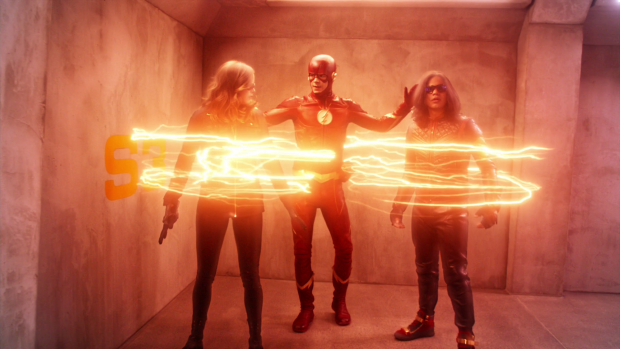 The whole point of Barry, Cisco and Caitlin working together to take on DeVoe hammers the point home that Team Flash are a team and they need each other to achieve their goals. Cisco’s argument is around his own feelings of guilt around this situation. He takes it right back to the first episode of the season and points out that none of this would be happening if he hadn’t freed Barry from the Speed Force. He was indirectly responsible for the creation of the Bus Metas in the plan that led to Barry being freed so feels that he is more than partly to blame for DeVoe’s plan getting to this point. His guilt means that he wants to be involved in fixing it and won’t accept Barry trying to bench him out of fear for his safety. It’s a rare argument for this show as both sides have merit and the discussion makes good use of the characters as well as their history together. The decision to use Flashtime against DeVoe has been a long time coming and raises questions around why Barry didn’t suggest this before. I’ve said on several occasions that “Enter Flashtime” explored an extension of Barry’s abilities that basically broke the show. This is worsened by his ability to bring Cisco and Caitlin into Flashtime and keep them there without touching them basically opens Team Flash up to limitless possibilities that can be accomplished in minute fractions of a second. Basically unless the enemy is a Speedster of greater or equal speed to Barry then there is no threat. The challenge here is down to how many people need to be saved along with a list of reasons why Barry can’t do it on its own. Fair enough it’s a conceit to get the rest of the team involved but expanding the possibilities of Flashtime as a concept is very problematic for the future of the show if threats are ever to be considered significant again. This is proven pretty much right away when Barry makes it through DeVoe’s portal, uses the weapon gained last week to bring down a portal and then has a chat with DeVoe for no real reason. For starters it should have raised a red flag when DeVoe showed no concern over the destruction of his satellite but Barry seems content to debate philosophy with him as if he has the time to waste. Considering his speed he definitely has more than enough time and power to drag DeVoe to the pipeline, put a power damper on him and conduct the philosophical discussion on his own terms in complete safety. Instead he provides DeVoe with yet another opportunity to get the upper hand on him and boast about the upcoming enlightenment. I would say this is lazy writing but Barry is consistently written as being this stupid so I’m led to believe this is just the sort of person he is. 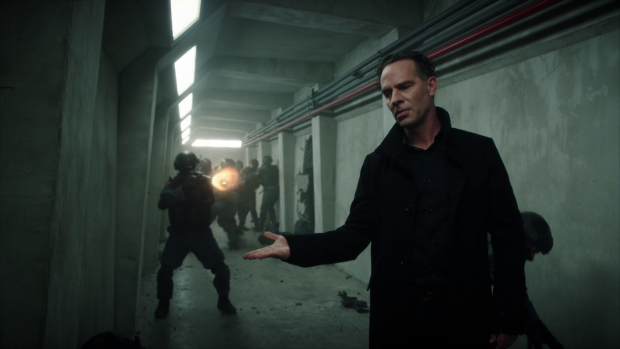 The episode ends in predictable fashion with DeVoe stealing the S.T.A.R. 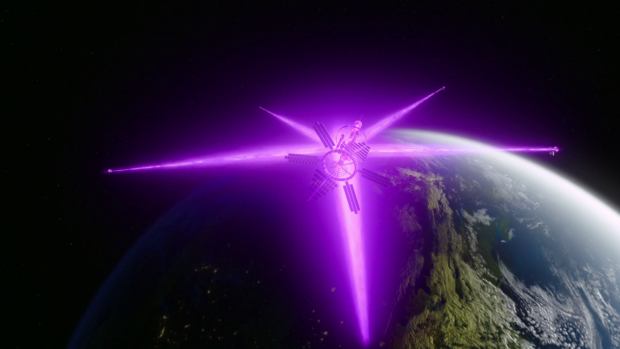 Labs satellite and starting the enlightenment as Team Flash are powerless to stop it. Nothing about the cliffhanger is effective because it was always clear that this would happen so there is no inherent shock value attached to it. There is no hope for DeVoe becoming a satisfying antagonist this point and the only consolation to all of this is that the season is almost over. A tedious episode that spins its wheels on the various plot threads in uninteresting and predictable ways. 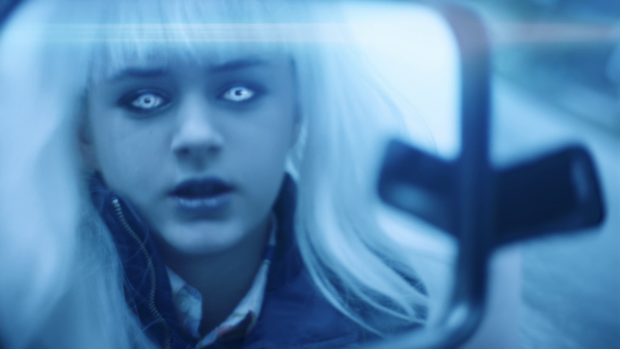 Caitlin’s quest to restore Killer Frost still fails to create any investment in this particular plot. The work hasn’t been done to make it worthwhile and the addition of Killer Frost being part of her childhood long before the Particle Accelerator explosion is interesting to some degree but since the whole plot isn’t that compelling to begin with. Harry’s loss of intelligence is really tedious and ruins the potential of the idea by playing it for laughs rather than making a meaningful story about a man losing the thing that he feels defines him. The continuation of the emotional intelligence angle leads to a really clumsy realisation from Iris as to Marlize’ whereabouts. Unfortunately Iris’ return to journalism has no real impact on this episode despite the perceived importance in the previous episode. Another tedious plot is Cecille’s pregnancy that now has her taking on the personality of people she comes into contact with. This results in a painfully unfunny scene where she absorbs the personality of a walking stereotype pizza boy and a later instance of her becoming Joe. The latter is really repetitive because we’ve already had her random ability provide greater insight into Joe from her perspective so there’s nothing new here. 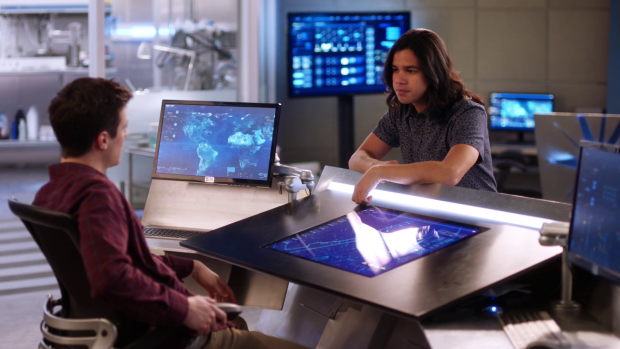 The strongest characterisation in the episode comes from Barry and Cisco who both have their reasons to blame themselves for the current situation. The point of their argument is to get to the point where Barry is comfortable accepting the risk that comes with help in the field. It works well enough though the expansion of the Flashtime ability further breaks the show in potentially irreparable ways. This is proven almost immediately when Barry has a chat with DeVoe instead of using his obvious advantage to bring him in. It’s lazy writing and furthers the idea that Barry is just that stupid considering how consistently this comes across. The episode definitely wins points for an excellent action sequence right at the beginning of the episode. It’s really well put together while showing DeVoe’s raw power and complete disregard for the well-being of others.